Although honorable, there is something disheartening about being presented in a museum on your 45th birthday. I've been keeping this somewhat of a secret the last few months because I wanted to see the end result. But, what an honor it was to be invited to be a part of the Bob Bullock Texas History Museum's exhibit of Big Bend National Park honoring the 100th anniversary of the National Park Service. The exhibit (from left to right) consists of an enclosed glass case with my Yashica-A twin lens (6x6) medium format camera I took on my first trip, my old vanity license plate, a koozie I made for Sarah and I's wedding guests on October 7, 2006, and a Backcountry Roads of Big Bend National Park tour guide book I purchased on a 1993 trip I took. In the middle is a five foot wide gliché print I took of the Sierra Quemada on a very special trip with Zane Thomas and Shea Thomas back in 2005. And then we have my little profile plaque with an audio excerpt from my interview with the museum in February essentially talking about the inspiration for this picture. I'm one of several photographers, one of whom is our very own TJ Avery and other Big Bend lovers who have their works displayed and it is a real honor to be representing some amazingly talented Big Bend photographers of whom I don't feel worthy being displayed next to. The exhibit starts today at the Bob Bullock Texas History Museum in Austin (next to the State Capitol Building) and ends Sept. 18th! As soon as the museum posts the audio clip online, I'll share it with you. I hope you all can check it out! Respect well due! and Happy Birthday to you old museum piece! Humble, and well deserved. Very nice David. Congratulations! And Happy Birthday! 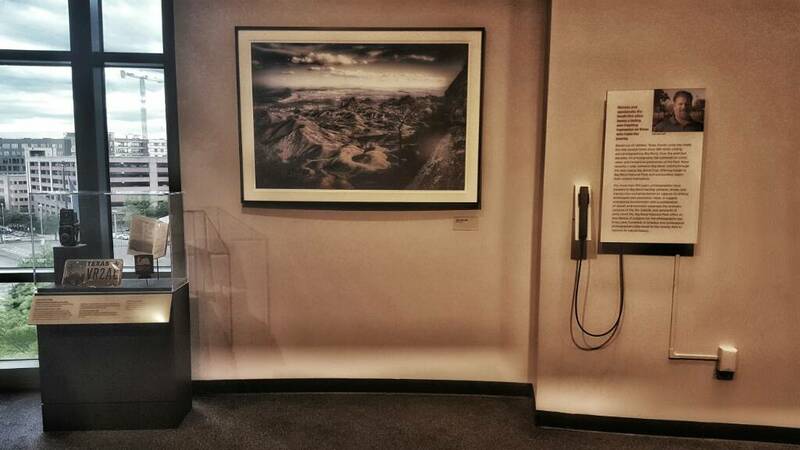 Congratulations, David - on both your photos and exhibit in the musuem (what an honor!) as well as for this website you single-handedly brought to life. You've probably saved the NPS a million dollars in ranger time at the front desk that otherwise would have been spent answering (and re-answering) visitors' questions. Your website has more useful BBNP info than any resource out there. Don't be disheartened. Awesome! and congratulations. I really wanna go and see this. Thanks guys. Yes, it is an honor and they were very nice and did a fantastic job with the exhibit. TJ was there. He had several prints displayed. I spoke with Laurence Parent briefly and I spoke with Cindy Ott-Jones, BIBE Superintendent. We had a pleasant conversation and I invited the Park Service to be an integral part of the Chat page. I expressed my feelings on this whole sour relationship and hoped we could become cordial like we used to. I expressed my feeling at the importance of offering current, accurate information in all aspects of the park, but I had no intentions of censorship. I felt like she was receptive as she suggested her new social media person, who hasn't officially been hired yet , could offer official NPS statements to discussions. So, I don't know. I said what I wanted to say to her. I felt good about it and now the ball is in their court. I do ask if they decide to participate we can maintain some civility. We can disagree without being asses about it (speaking of myself). All in all, it was a good preview last night and I really enjoyed myself. The museum did a great job representing our beloved park. I spoke with Cindy Ott-Jones, BIBE Superintendent. We had a pleasant conversation and I invited the Park Service to be an integral part of the Chat page. I expressed my feelings on this whole sour relationship and hoped we could become cordial like we used to. I expressed my feeling at the importance of offering current, accurate information in all aspects of the park, but I had no intentions of censorship. I felt like she was receptive as she suggested her new social media person, who hasn't officially been hired yet , could offer official NPS statements to discussions. So, I don't know. I said what I wanted to say to her. I felt good about it and now the ball is in their court. I do ask if they decide to participate we can maintain some civility. We can disagree without being asses about it (speaking of myself). Well we will have to keep presidio and elhombre apprised of the situation but I do applaud you for having an open conversation with her, maybe it will help. I have felt a bit of thawing of the relationship in the last year or so. Why doesn't this forum have a like button??? LIKE! Lol. Funny, I've been trying to figure out how to do that for years.